The George Petersen Sr. 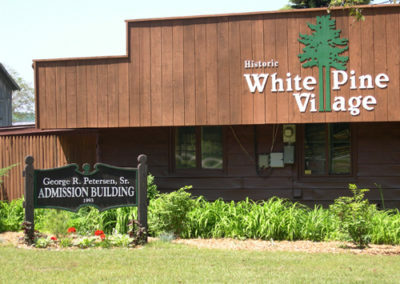 Admission Building provides an attractive and convenient entrance to Historic White Pine Village. 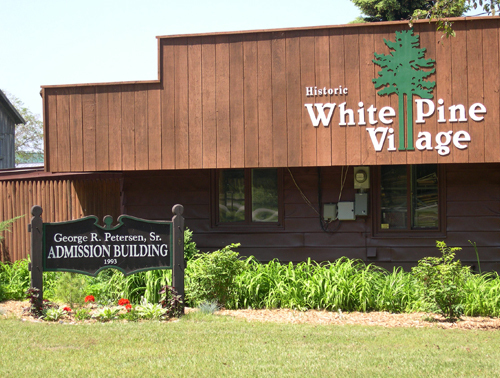 The building houses the gift shop, admission area, and the Mason County Historical Society Research Library. The extensive research library contains information files, obituaries, maps, photographs, documents, family histories, scrapbooks, oral history tapes, directories, and newspapers. The large overflow parking lot west of the paved lot next to the Admission Building is used as home field for the Ludington Mariners Old Time Base Ball Team.